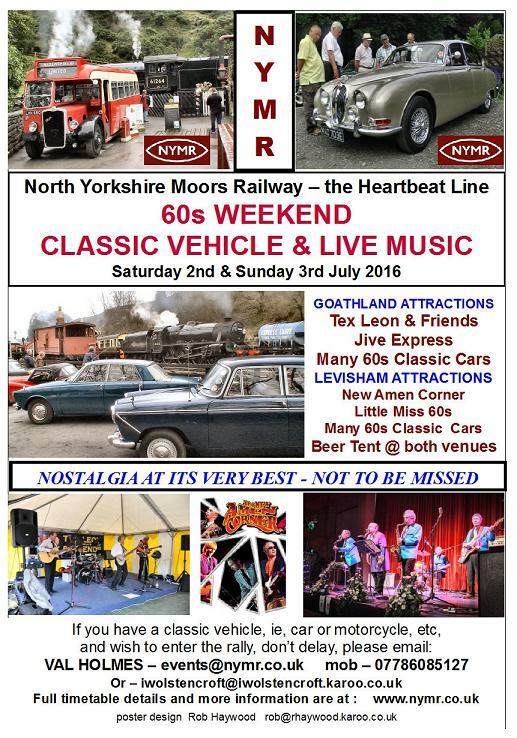 All cars from 1960s welcome , car clubs also welcome , contact Val Holmes.As part of the NYMRs 60s Weekend there will be 60s vehicles, hopefully including some that have appeared in Heartbeat. Event organisers Please note - If you wish to organise a club visit to NYMR, ie Goathland Station Carpark one sunday in 2019, please call the railway. There is a charge to display the cars £5 of which there is rail travel discount and Free access to the concert at levisham and goathland. The North Yorkshire Moors Railway operates steam trains along an 18 mile line between the market town of Pickering and the village of Grosmont, through the heart of the North York Moors National Park. We are also operating trains to Whitby on certain days of the year. The railway passes through a variety of scenery, from wooded valley to heather clad moorland. It also calls at picturesque villages along the way and offers access to unspoilt countryside and the sea for walkers and cyclists.